For months now we've been bombarded with ads declaring New Jersey "Stronger Than the Storm." The beach towns are using the slogan, too, to promote their recovery from Sandy. A few weeks ago my family took a trip to Keyport and Keansburg, New Jersey. Most everything had been rebuilt and reopened. I thought it might be fun to list what's back and what's not. We first went to Keyport. Even though I knew that Ye Cottage Inn, a landmark establishment, had been destroyed by the storm, I was unprepared to see it totally demolished. Gone. As if it had never existed. On a more positive note, the Keyport Fishery is open and better than ever. I had the best fried scallops I've ever had. They were on a white-bread sandwich, served with fries, homemade coleslaw, and homemade tartar sauce. Not fancy, just excellent. DH and DS had flounder sandwiches. The fish is fresh-caught, pure white and flaky. They liked the fish, but I think they liked my scallops better. Fortunately for me, the portions here are generous, and I still had plenty after sharing. 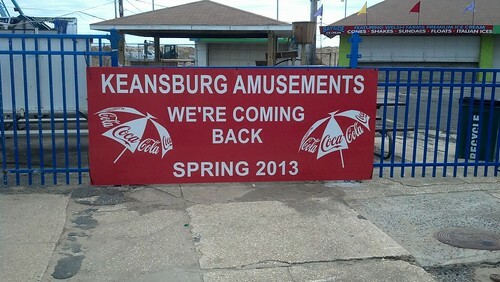 Finally we went to the amusement park at Keansburg. We'd seen video from Keansburg on TV after the storm, and it showed arcade game machines floating down the street. When we visited last month, our favorite arcade, Bev and Wally's, was open. The wall was adorned with a huge banner thanking people for their post-Sandy support. The room was filled with the sights and sounds of game machines, which were just on the brink of overload for me. On a sad note, the Pop-a-Ball machines were gone. I suspect they were going to be retired soon, anyway, because they were getting to be high-maintenance. But it was still disappointing to see a favorite game taken out of play. Overall, though, Bev and Wally's did not disappoint. The games are all new or like new. One interesting point is that the machines now accept only tokens--no coins. And the arcade has purchased a boatload of tokens, which are labeled as Post-Sandy Collectible. I'm not always fond of my home state, but the spirit and vigor with which these shore towns have rebuilt makes me proud to be a New Jerseyan. At least until the next scandal! It's so nice to hear that most businesses were able to recover after the storm. The Jersey Shore wouldn't be the same without them.